Titan Comics - HEROES: VENGEANCE #2 Review | Warped Factor - Words in the Key of Geek. 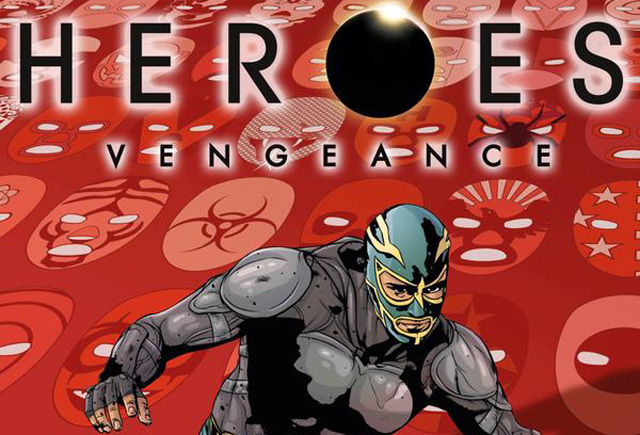 Heroes Vengeance issue #1 gave us the backstory and current story of an EVO – a hero, or person with special powers – named Oscar Guttierez, who dons the mask of a Mexican wrestler named El Vengador to bring justice to the streets of East Los Angeles. To some extent then, we’re in déjà vu territory with issue #2, which…erm…gives us the backstory and the current story of Oscar Guttierez, who – well, you get the picture. We do learn some new elements – in issue #1 Oscar mentions that his grandfather taught him a lot of things. It’s less clear in that issue that his grandfather was the original El Vengador, but that becomes clear immediately in issue #2. The seeming lack of brother Carlos in Oscar’s life at the moment is explained in a single panel, which shows Carlos in the uniform of the US Army, though we’re not yet sure whether Carlos is simply away on duty or has paid a soldier’s price for the society in which people like his brother are increasingly viewed with suspicion and vilified. But beyond these elements, there’s a distinct feeling of having been here already – Oscar learns of a gang operation from the position of the floor while repairing a gangster’s car in his role as mechanic, then turns up as El Vengador to break some heads and interrupt an illegal shipment, bringing justice and hope to the streets. Given that he turned up to defeat some gangsters in issue #1 and bring some justice and hope to the streets, you can see where the déjà vu comes from. But there is a degree of pushing the modern-day story forward as well as deepening our understanding of Oscar’s influences and motivations: the shipment he interrupts turns out to be more complex than he imagined, and its interruption will have far-reaching consequences, with El Vengador probably painting a giant target on his chest for the gangsters to aim at, meaning very little will be the same going forward from this issue. It also paints us an extension of the story of the original El Vengador, who the gangs tried to bribe to take a fall, but who refused their money – while Oscar learned some skills and some thinking from watching El Vengador in the ring, he learned the principles that make him a good man from his grandfather Luis, who would not compromise his personal integrity for the sake of financial ease. While as yet we have not been told as much, we strongly suspect things may not have ended well for the original El Vengador after that decision, so there are distinct strands by which the story is taken forward in this issue by writers Seamus Kevin Fahey and Zach Craley. 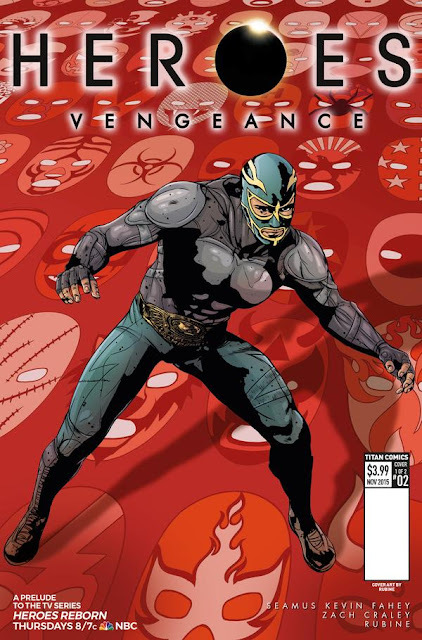 The fact of it feeling so very similar to issue #1 seems to be a by-product of the narrative structure, starting with the wrestling match, cutting to the present day as a counterpoint, and then intermingling the lives of the original and the new El Vengador. The heavy underscoring of the similarities between them and the lessons the one taught the other feels familiar from issue #1 too, with the younger Gutierrez applying the lessons he learned in a way that only an EVO can, turning strong principles, a desire to make the neighbourhood safe for good people and the skills he learned from watching his grandfather fight into a crime-fighting vigilante persona that can turn the inspiration and the hope he got from the original El Vengador into a Batman-like symbol of a wider hope for people in his world. So while there are threads that pull the story forward in both the here and now and the there and then, the overwhelming sensation at the end of issue #2 is of asking “Didn’t we do this already?” – the story is broadened, deepened and advanced, but still it feels like another day at the same office. Artist Rubine feels a little trapped in the formula of the storytelling here, but faithfully delivers what feels like more of the same – the wrestling shots, another bout against a stronger opponent, poignantly named El Diablo, the contrast between the bright, well-lit colours of the ring and the blueish greys of steel and oil that make up Oscar’s day-job, and the colour that comes into his life when he either remembers his own childhood, or relishes that of his own son. It’s effective, workmanlike art that will give you both the atmosphere and the emotion of the story, and rendering part of Oscar’s takedown of the gang in silhouette works to show a degree of its mechanical nature – bad guys feeling like elements in the path from the problem to the solution. You simply solve each of them until you win. What we’re looking for in issue #3 though is a radical jump forward in the plot, to show us what happens next to both incarnations of El Vengador, after they’ve made a move that seems to close off the possibility of a quiet life. We want more of a sense of Oscar’s EVO nature too, otherwise Heroes Vengeance is left feeling a little like a Latino Batman comic, rather than stamping its Heroes brand on the action. Here’s hoping for more plot and less in the way of simple slapdowns in round three.